1. Bring water to a simmer in a medium saucepan. Stir in freekeh and cook for 10 minutes; remove from heat and keep warm. 2. While freekeh is cooking, set aside 1/2 cup of beans and place the rest in a small food processor with yogurt, lemon juice, rosemary and garlic. Puree until smooth and season with salt and pepper. 3. 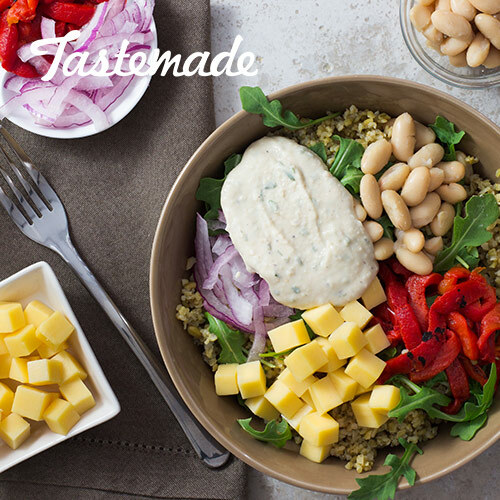 To assemble bowls, place equal amounts of warm freekeh into 4 bowls and top with greens, cheese, red peppers, onion and reserved beans. Top each with spoonful of white bean puree. Note: Freekeh (free-kha) is roasted green wheat. It's high in protein and has almost twice the fiber and is higher in protein than quinoa. It's also high in iron, calcium and zinc.